As you may have read, I recently discovered cauliflower. This awakening has been akin to a religious or sexual one – I just can’t get enough. I want cauliflower all the time. I want to try new things with it, brag about it to my friends, and generally obsess over just how great it really is. I’ve seen the light, and there’s no going back. Much like when I thought Brussels sprouts couldn’t get any better – and then added bacon, I was sure I had mastered cauliflower with my rendition of Delfina’s crowd- pleasing side dish. Enter the food processor. 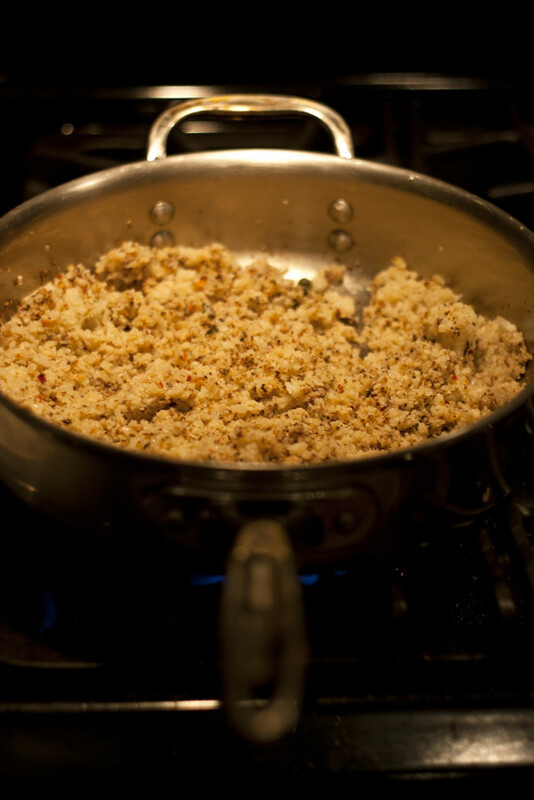 Chop away at some raw cauliflower florets and they magically turn into little couscous-like pieces. With a bit of oil and a lot of heat, this crumbly goodness becomes delicious “fried rice” in a heartbeat. Since cauliflower is relatively mild in flavor, your brain might actually believe you’re feeding it carbs, when, in fact, you’re really giving it a healthy dose of vitamins and nutrients. Gottcha! The cauliflower retains its general tenderness, while some bits get nice and crispy. The peppers and garlic heat things up, so season with caution. The spice level is cut by the sour capers, which crisp up a little if you add them to the pan early enough. In small batches, pulse cauliflower in a food processor until texture is consistent and rice-like. In a large heavy-bottomed skillet, heat 2 tablespoons olive oil. Once oil is piping hot, add cauliflower. Stir often. Once cauliflower begins to brown, add minced garlic, garlic powder, crushed red pepper, capers, salt, and pepper.